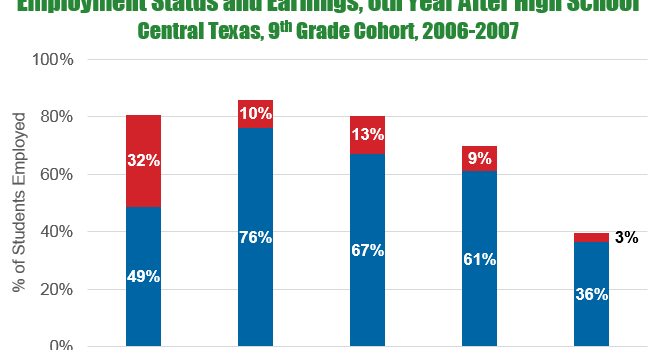 We followed a cohort of Central Texas 9th graders through high school, college and into the workforce. The above graph shows the proportion of each educational group who are employed in Texas in the sixth year following high school. Those individuals who are earning above $40,000 a year are graphed in red, and individuals who are earning less than $40,000 appear in blue. The data comes from unemployment records from the Texas Workforce Commission, which allows us to explore the employment and earnings of people who are employed in Texas, but does not contain information for individuals who are self-employed or employed outside the state. Thus, overall employment rates are understated as we are not able to track employment outside of the state of Texas, nor are we able to track jobs that are not typically reported on labor records (working as an independent contractor, driving for Lyft, etc.). Rates of in-state employment are similar across all groups who enroll in college, regardless of degree completion. 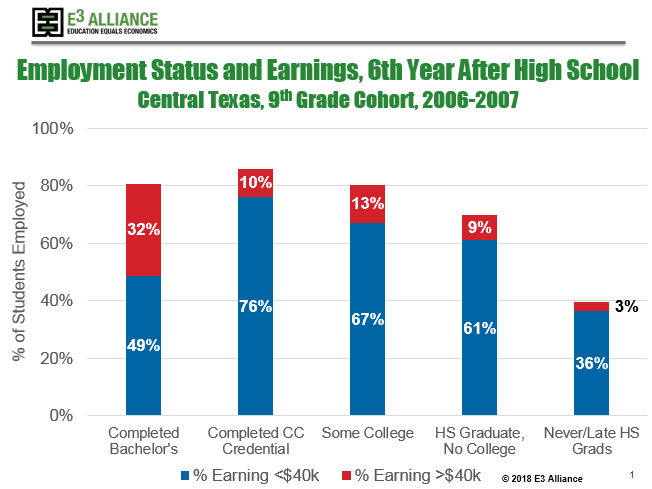 Close to 80% of individuals who complete a bachelor’s degree, a community college credential, or some college but no degree are employed in Texas during the sixth year after high school. Rates of in-state employment are lower among individuals who complete only a high school diploma (70%) and individuals who did not graduate high school on time (39%). Turning now to earnings, we can see that 1 in 3 individuals who complete a bachelor’s degree earn more than $40,000 during the sixth year after high school, compared to around 1 in 10 individuals in the other categories of high school graduates. There is a great deal of similarity in the earnings of people who graduated high school but did not enroll in college, people who enrolled in college but did not complete a degree, and people that completed a community college credential. Keep in mind that these are early career earnings – variation in earnings between these groups could compound or dissipate over time. 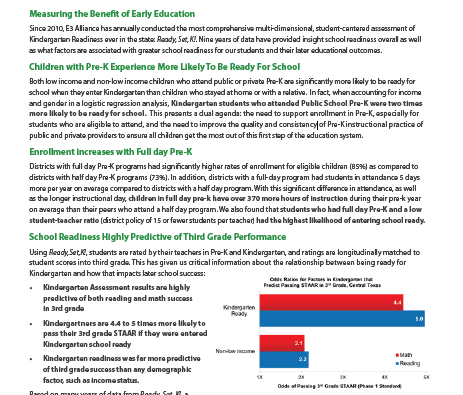 Additionally, there is a great deal of variation in program of study within each of these educational attainment categories. People with bachelor’s degrees could have majored in English or engineering, and people with community college credentials could have an applied associate’s degree in a high paying healthcare field, or a short-term certificate. Future research could explore long-term earnings patterns, as well as patterns within educational attainment categories.